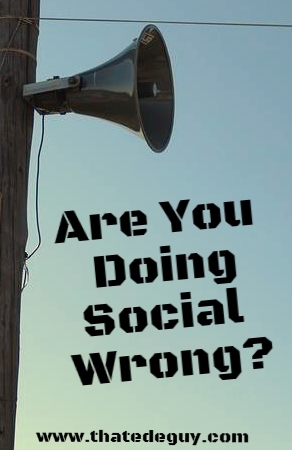 Are You Doing Social Wrong? No matter where you look online, there are experts that are saying that, if you want to win online, you must win in social. And the truth of it all is that they are right. You must win at social if you want to win online. More and more content is being digested there. More and more people are using social as the only source of information. Unfortunately, many of you are doing social very wrong, and risk losing what foothold you have. How you’re doing social wrong. The single biggest thing that most of you can’t seem to figure out is that social is, well, social. Mostly, those of you that are playing the game as if it were traditional marketing. It’s not. This isn’t newspaper, or television, or even radio. You don’t get to just develop your marketing plan, and push your marketing out and wait for the customers to roll in. It won’t happen. Not only will it not work for you, but it’s very likely to convince many of the users to disengage from you altogether. Too many of you are performing the equivalent of hit-and-run social media. You sign in long enough to drop your promotional tweet, facebook post, or other self-serving post, then running off to go about your business. And yet, you can’t seem to garner any real growth or conversation. Maybe you have even gone beyond that and are trying to return some value to your customers by posting coupons and giveaways. I’m sure that your level of interaction really jumps when you do that too. But, if it’s dropping back down to normal levels on your other posts, you’re still doing it wrong. How you can start doing social right. For the love of all that is digital, start being social on social. If you really want results, you must start the conversation. Interact with the people you would have as consumers. They aren’t just wallets walking around, but actual humans with human thoughts and emotions. And, for the most part, humans are social beings. If you’ve ever been to a large social event, you’ll have noticed that the people at the event usually fall into immediate groups. Maybe it’s the person they met right away in the hotel lobby, or someone they know from another event. What you won’t notice are people just walking up and introducing themselves to each other. Sure, there’ll be one or two people that do this, but for the most part, they’ll be sitting in their small groups, or alone at their tables, not really interacting with anyone at all. If you want to grow your network at an event like this, those are the low hanging fruit. You can walk right over to the table, introduce yourself and ask if you can sit down. It’s not so much different on social. The majority of the people are not going to “walk” up to your social account and interact on a regular basis. Instead, they’ll wait until they have a problem with your product or service and you’ll know when they start blasting you. Truly taking advantage of social means being proactive, and reaching out to customers. Not when they have a problem with your company (although that’s also important), but when they don’t have a problem. When they’re the ones sitting alone at a table in social, maybe they’ve mentioned your company or a product that’s similar to yours, introduce yourself, and start a conversation. Which doesn’t mean you immediately start blasting them with promotional talk. An actual conversation. Consider; You have two people who want to sell you something. One of them is a friend, and the other is not. Which of them is more likely to get your business? The friend. Why? Because you have an existing relationship with the friend. To some degree, you trust the friend to not sell you up the creek and to treat you right in the transaction. I doubt that you’ll ever reach the point where a social customer is going to consider you a true friend. But, you can build relationships that will build trust in your company and your brand that give the customer the same trust. If that relationship exists and the customer truly can believe that you aren’t going to disappear as soon as the sale is made, you’ll earn a lot more business through social. Building those relationships doesn’t have to take all of your time. Unless you’re rolling out a social team for a major corporation, you maybe don’t even need a full-time employee to manage the accounts. With the right tools, you can set up alerts to notify your social media manager of mentions of your brand, mentions of similar products, and even certain activities. When those alerts roll in, it can mean a quick 5-10 minute run through to respond, to open up the conversation, or answer the questions. With the right social media strategy, you can be building up relationships with customers by reaching out and having real interactions with them. Those interactions will grow the number of people listening and can help you grow the loyalty of your customer base. It’s only a part of the overall business equation, but as more and more people migrate to the social platforms, it’s becoming an ever increasingly important part of an overall business marketing plan. What are you doing right on social?